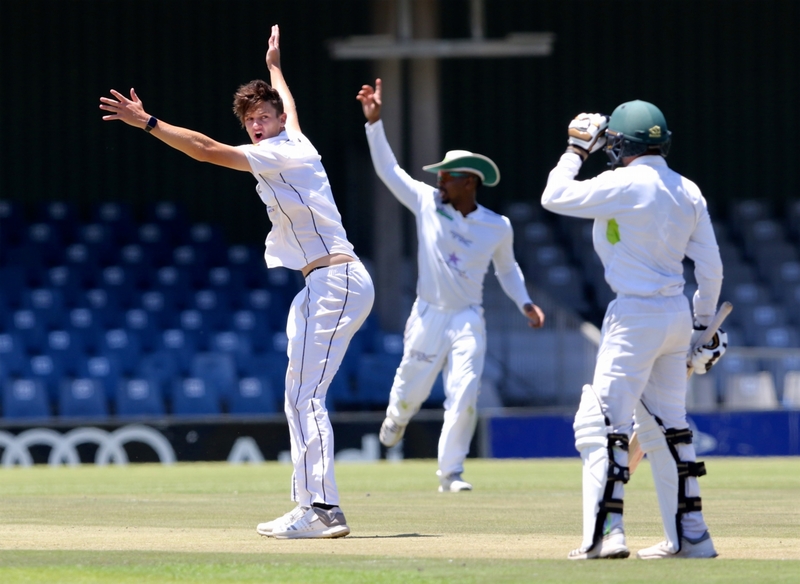 Rain and later bad light spoilt what could have been an interesting last day’s play in the Cricket SA four-day franchise match between the Warriors and the Hollywoodbets Dolphins at Buffalo Park on Thursday, with the match ending in a most unsatisfactory draw. In the end, the Dolphins were well on target for a win at 171 for five wickets looking for 275, and with 22 overs left for play. The Warriors resumed the battle early on Thursday with the last pair of Thomas Kaber, 5, and Basheeru Walters, 0, at the wicket. With a score of 163 for nine wickets and an overall lead of 274 runs and 104 overs left for play, it looked like anybody’s game. But after only nine balls and without addition to the score, down came the rain followed by a frustrating break of just over three hours. During this period 36 overs were lost and it came as no surprise when Warriors’ skipper Jon-Jon Smuts declared the innings closed, setting the Dolphins the tempting target of 275 to win off 67 overs at about 4.1 runs to the over. The Dolphins set off like the proverbial house on fire. Both openers, Sarel Erwee and Michael Erlank scored boundaries off the first ball they each faced, but then Glenton Stuurman broke through Erwee’s defence and bowled him at 11/1. Marques Ackerman, who scored 84 in the visitors’ first innings, joined Erlank, and soon overtook his partner. At 30 Erlank was out, caught by a diving Sisanda Magala in the slips off Walters. Ackerman raced to 20 not out with four boundaries and added a quick 15 with new partner Khaya Zondo, the Dolphins captain, but at 45 for two wickets, down came the rain again. This time the break lasted just over an hour and play resumed at 2.45pm. With 230 still required, the overs were accordingly reduced to 41 at 5.5 runs to the over. Zondo went on the attack and 16 came off Magala’s third over. The unorthodox left-arm spinner Kaber was introduced into the attack, but his first two overs cost 15 runs. Then tea was taken at 78/2 with 37 overs left for play and 197 runs to win. After tea Ackerman raced to his half-century (46 balls, 10×4) but then at 91 Zondo was out, flashing once too often against Walters, and he was caught by Kaber in the slips. Ackerman impressed with some magic square drives through the offside field and he smacked Stuurman for a huge six, only for the bowler to gain his revenge next ball. Ackerman, 77, nicked one to wicketkeeper Sinethemba Qeshile. Sibonelo Makhanya smacked eight fours and a six out of his 41 runs, being utterly ruthless on Kaber in his second spell. Kaber’s five overs cost 38 runs. At 148 Magala returned from the city end and first ball Senuran Muthusamy, 4, popped the ball into the covers for a catch.